Sometimes, a wonderful creation can be stuck with a terribly unfortunate acronym. 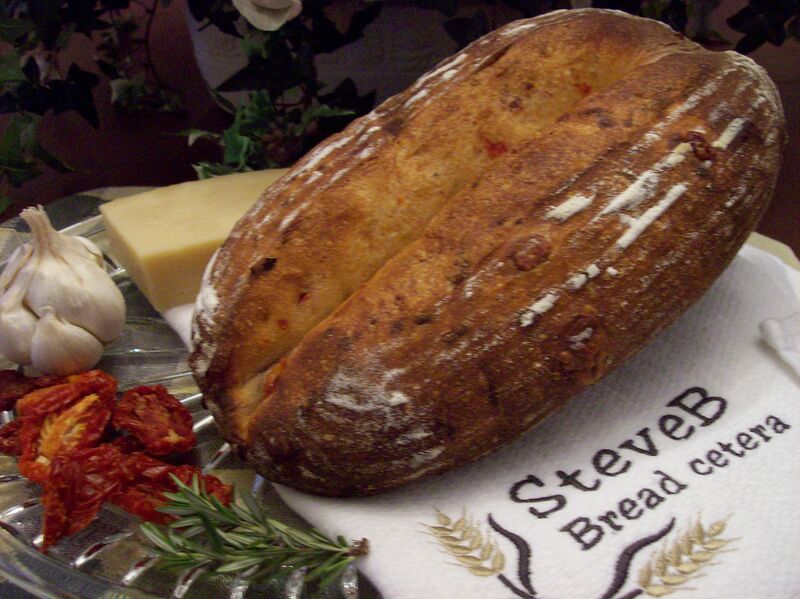 When first published in the May 2005 issue of Modern Baking, Steve Barnhart of Bennison’s Bakery in Evanston, IL chose to call his richly-flavored bread, laden with tomatoes, Asiago cheese, roasted garlic, rosemary and Parmesan cheese, “TARRP” bread. Little did he know that only 3 years later, an almost identical acronym “TARP” (Troubled Asset Relief Program) would come to represent the U.S. government’s response to the greatest financial crisis this country has seen since The Great Depression. 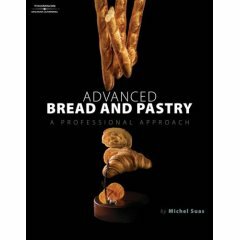 Its unfortunate moniker aside, this version of TARRP bread works wonderfully as a surprising synergy of what one might at first glance expect to be strongly competing flavors. 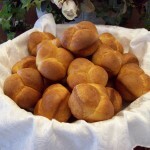 But make no mistake; this is a specialty bread. 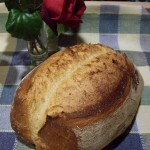 TARRP bread is not one to have as a daily bread with meals but rather can almost be a meal in and of itself. The night before the bake, the garlic was roasted by cutting off the top third of a bulb of garlic, coating the exposed cloves with olive oil, wrapping the bulb in aluminum foil and roasting in a 375ºF oven until the garlic is light brown and fragrant, about 40 minutes. The garlic was then removed from the oven and allowed to cool to room temperature. The garlic bulb was then squeezed to extract the roasted garlic from the cloves and the garlic was mashed with a fork to form a paste. 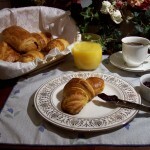 The next morning, all of the final dough ingredients were placed in the bowl of a stand mixer and mixed with a spiral dough hook on the lowest speed just until all the ingredients were incorporated, about 2-3 minutes. 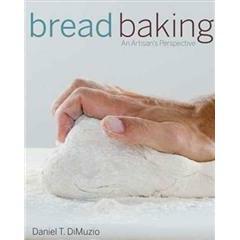 The dough was then allowed to rest for 20 minutes, after which time it was hand mixed until a medium consistency dough was achieved, about 7-9 minutes. The dough was then placed back into the stand mixer bowl and all the blend-in ingredients were added. The dough was then mixed with a spiral dough hook on the lowest speed for 2-3 minutes, just until the add-ins were fully incorporated into the dough. 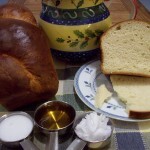 The dough was then placed in a lightly oiled, covered container and allowed to ferment for 3 hours, halfway through which the dough was given a fold. 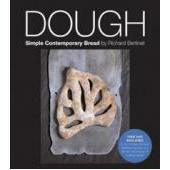 The dough was then divided into two equal-weight pieces and each piece was loosely rounded. After resting, covered with plastic, for 15 minutes, the dough pieces were shaped into fendus (see video here) and proofed, channel side down, in brotformen at 76ºF for 2 hours. 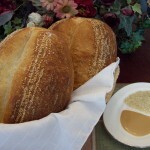 The loaves were then turned onto a peel and baked at 450ºF for 30 minutes, the first 15 minutes being under steam. I have missed your posts, good to have you baking again. The flavourful combination of blend-ins gives me distinct Mediterranean/Italian associations… In addition to being a meal in itself, I guess the loaf goes well with just about any kind of pasta dishes. 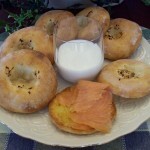 Inspiring recipe! 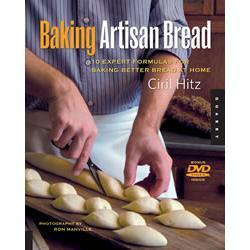 Hi – I’ve only begun to bake bread a few months ago and am not sure of all the terms yet. 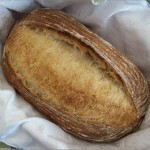 But how do i mix the 180g mature liquid levain? do i have to make this levain the evening before? 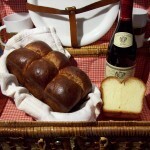 the bread looks so delicious, I’ve simply got to give it a try! Mouthwatering! 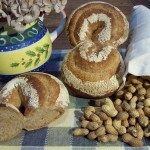 I absolutely love that kind of bread. Near my working place, there’s a fantastic baker, full of imagination, who sells (at a rather high price, that’s the bad side of this story) specialty bread that are each week different. He presented one with “Beaujolais Nouveau et lardons” just when the young Burgundy Wine Beaujolais 2008 was put on the market, for example. He regularly sells bread with goat cheese or parmesan and semi-dried or dried tomatoes, and I sometimes make my lunch out of one of those, along with fresh fruits. 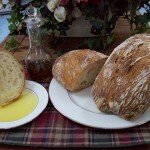 But his breads contain a fair amount of olive oil, I’m afraid, and yours doesn’t, I like that. Next week, I should bake one of your loaves instead! Thanks, Steve. 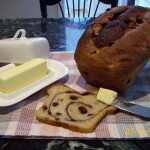 Unfortunate acronym or not, what a beautiful loaf with an oh-so-tempting combination of ingredients! Jane, I thought you might like the towel! Paula, your encouragement is always appreciated. Hans, you are quite right about the Mediterranean/Italian character of this bread. My kitchen smelled like a pizzeria when the bread was baking! Arundathi, I have my starter on a 12 hour feeding cycle (at 72ºF) so I feed it the night before, in a ratio of 25 g starter: 90 g flour: 90 g water. Flo, you’re lucky… near my workplace is a McDonald’s! 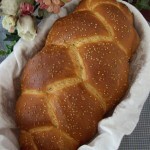 One of these days I have to try baking a bread with lardons. I can almost taste it as I type… yum! 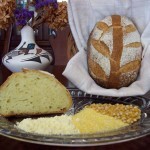 Susan, this bread would be an excellent showcase for some of the fine cheeses and produce you have there in California. 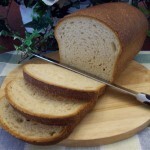 Bread looks delicious.What does it looks inside? 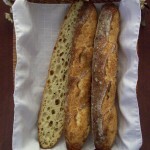 Alla, the crumb is a bit less open than a standard pan au levain of similar hydration due to the ‘heaviness’ of the blend-ins. 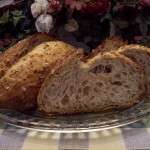 The sun-dried tomatoes also give the crumb an unusual light pink hue. What could I use instead of Asiago Cheese. I can’t get it here in Christchurch. A few alternatives would be appreciated, thanks. Chris, any sharp hard cheese should be fine as an alternative to Asiago. I would think that a quality Romano or perhaps even a Cheddar might work well. It’s really all up to your own personal taste. Now next Nongy question. Is the 35g of garlic before or after roasting? Chris, that would be 35 g of garlic after roasting. 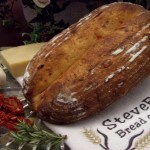 Beautiful looking bread, Steve, as usual. One question though, does the garlic take over or do the other flavours come through equally as well? 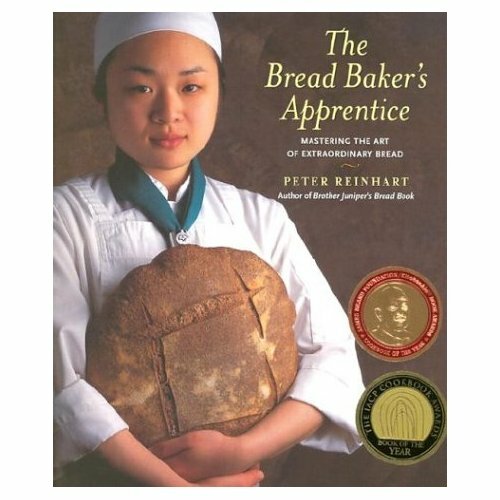 I was just looking at a cheese and garlic bread recipe (Della Fattoria’s Rustic Roasted Garlic Bread) in Maggie Glezer’s “Artisan Bread” and wondering if the garlic is overpowering and permeates the bread or if it is only garlicky in the places it is. 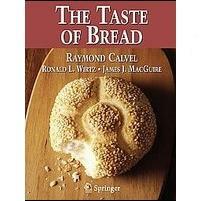 Elizabeth, the garlic flavor does permeate the bread, but it is not overpowering and the other flavors do assert themselves. The different flavors actually work very well together. 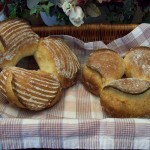 It is a very different effect, though, from the one you get from the Della Fattoria bread because in this bread, all the ingredients are actually blended into the dough. 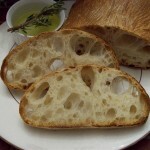 I have to say, though, that the Della Fattoria bread is wonderful in its own right. Christiane, c’est vrai. 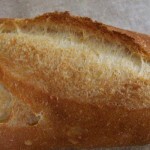 Ce pain a le goût d’une pizza! 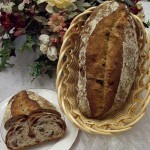 TONYK, the way to create a liquid levain can be found here. In this instance, I use the term “liquid levain” synonymously with “liquid starter”. 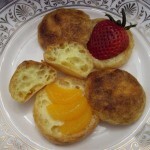 Looks delicious, I will be trying this soon. 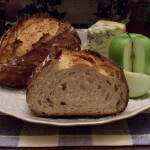 When I’ve made cheese breads in the past the size of the cheese pieces had a very big impact on the crumb structure/texture. Can you give us an idea of how finely you’re dicing the cheese? Maybe the size of tic-tacs? catechus, I cut the Asiago cheese into ¼” dice. 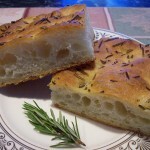 You’re spot on about this bread being a complete meal, the aroma also reminded me of a pizzeria as I was making it! The color lended by the tomatoes is lovely – unexpected. 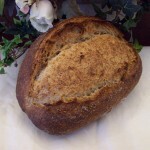 The combination of flavors is fantastic as well, I appreciate that the blend-ins don’t overpower the bread, yet lend a tremendous amount of flavor. I also experienced the “less open crumb due to heaviness of blend-ins” that you mentioned. I found that my loaf before baking had “spread” and flattened quite a bit, despite shaping a tight batard. Could i have possibly over-proofed my loaf? or under-mixed the dough? I hand-mixed for 15 min vs. 7-9 because I felt that the gluten hadn’t developed very fully. 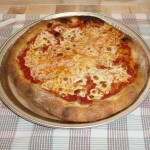 How should the dough feel after being hand-mixed – smoothness and strength? The dough also felt somewhat damp. I imagine too much water might contribute to the flatness of the bread? 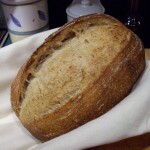 a2, Two possible reasons for your loaf “spreading out” before baking are too much water in the final dough and insufficient gluten development during mixing. 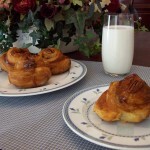 The dough should be mixed to medium development, as per the windowpane test, and should be smooth and slightly tacky prior to the addition of the blend-ins. 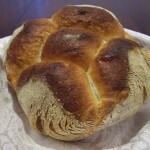 Very nice looking bread. Do you use sun-dried tomatoes packed in oil (perhaps patted dry) or ‘plain’ sun-dried tomatoes? I used plain sun-dried tomatoes but I imagine that sun-dried tomatoes packed in oil, after being patted dry, would work just as well. Thanks for the nice compliments about my bread. 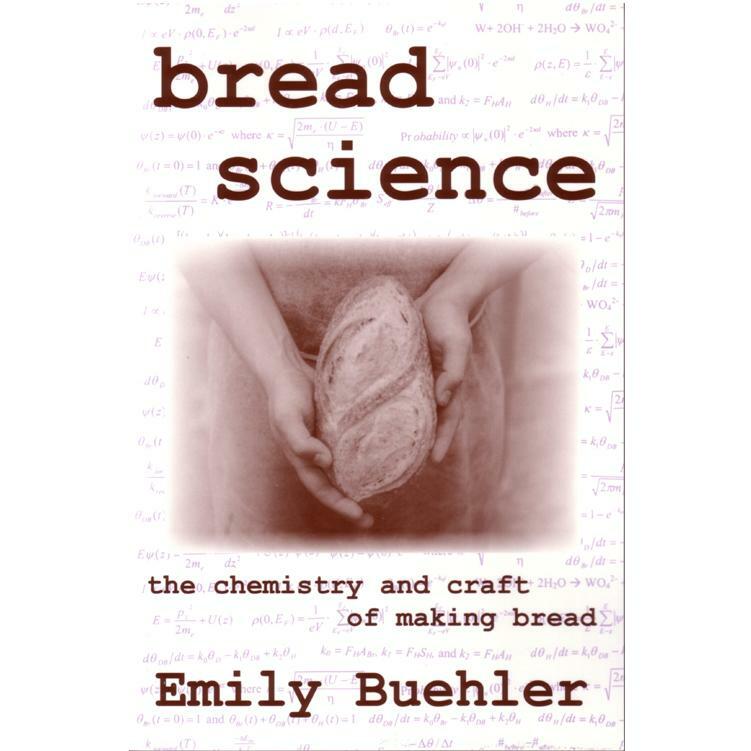 You did a good job converting it from a professional formulation into something a home baker can more easily understand. I had a great time, through various trials, experimenting with different flavors and levels of intensity for each ingredient until I finally landed with the final result. With that being said, I’m glad that your readers were able to enjoy my creation. 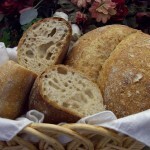 I must say that I have fun browsing through your site and seeing the different styles of bread you write about and make. Keep up the good work! Let me know if I can be of any assistance for your future articles! 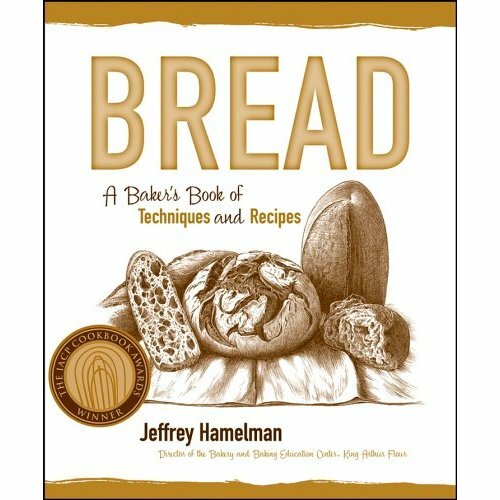 The thanks more appropriately go to you for your willingness to share this wonderfully creative and flavorful bread with us. I’m quite honored that you enjoy perusing the site. For those who are not familiar with Steve’s impressive credentials, a brief interview with him can be found here. How refreshing to finally see a part of TARP that actually works. Tried out this recipe yesterday. Turn out beautiful. Tx SteveB!